We landed a probe on a comet this year. Read that again. We landed. A probe. On. A COMET. We can do such great stuff when we set our minds to it. We celebrated. We were proud (and jsutly so) even with all the snafus that went on during the mission and finally scuttled it. We DID this thing. We were mighty. Today comes a different headline - one about a much older craft, one we sent off to Mars a decade ago. 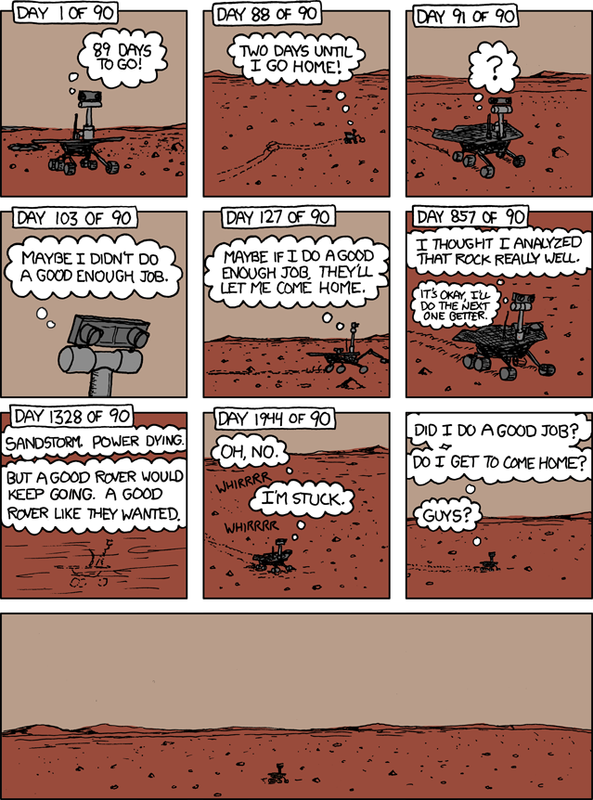 The little Rover named Opportunity is developing Alzheimer's. I am thinking about these sendings of the human spirit today, at the tail end of the scienc-fictionish year of 2014. With next year, we're halfway through the second decade of the 21st century. This is kind of amazing. And out there, on other planets, on cometary detritus out of the Oort cloud, little machines work and sleep, and sometimes send news of the stars back home to the Earth from which they came. This is even more amazing. It's a kind of melancholy note to end a year on. But - rest, Opportunity, you've done way more than was asked or expected of you. Rest, little Philae, who did an impossible thing, even if it wasn't perfect. Rest, and dream, if you have to. Others of your kind - I raise my eyes to the heavens and I pray and I hope this is so - will follow where you have led. In the meantime... looking back over the year that is ending and the fourteen years that have elapsed since the beginning of the new century... I just wanted to say, I am proud of you, and I remember you, and even when you go silent and lost out there in that bleak black vastness there are minds down here below who will remain proud of you, who will always remember you. For those of us down here, the flesh-and-blood folk still on the original beloved mudball... happy new year, everyone. May it bring you everything you are hoping for.